Only a fraction of the crimes committed across the UK are ever reported to the police. 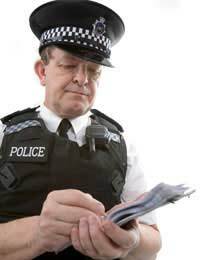 It is important that you do report any crime even if you think its minor to your local police force as this enables them to calculate their performance and see which areas of their services they need to improve. If you need to report a crime in an emergency dial 999 from any telephone. The call should be completely free. Some of today’s cordless phones rely on their base stations being connected permanently to the mains electricity. These phones won’t enable you to dial 999 in an emergency, so make sure you have another phone available in your home. Your mobile phone should allow you to make 999 calls. Some crimes that you may witness won’t be emergencies. It’s important that you don’t use the emergency 999 number for reporting minor crimes. If you do want to report a minor crime contact your local police station. You can find their number in your local telephone directory, or you can look up their number online at: www.police.uk/forces.htm. Where the crime took place. The date and time of the crime. If you saw any other witnesses. If a vehicle was involved, try and remember its make, model, colour and registration number. They will also ask if the vehicle had any distinguishing marks. If you are a young person who has become the victim it’s important that you report this as soon as possible. If you have been attacked, dial 999 as soon as you can. None emergency crimes such as your mobile phone being stolen should be reported to your local police station. Don’t use the emergency number to report these types of crimes. Whatever type of crime you report you will probably have to give a statement. Try and tell the police, as much as you can about the crime you witnessed or that you were a part of as a victim. Your statement will be used if the case goes to court. If you are nervous about giving report the crime, you can use the Crimestoppers website. It may be difficult for you to report a crime for hear of reprisals against you. This is where the Crimestoppers website can help. You can call the service completely anonymously and free on: 0800 555 111 or visit their website. The service is available 24 hours a day, 7 days a week. The cost of benefit fraud costs hundreds of millions of pounds each year. The Department for Work and Pensions has a benefit fraud hotline you can call if you think someone is claiming benefits they shouldn’t. The phone number is: 0800 854 440. You can call between 7.00am and 11.00pm 7 days a week. Mypartner is a repeat offender. Would he be eligible for HDC?